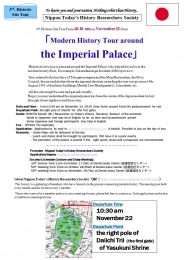 Historical sites tour is planned around the Imperial Palace, who played key roles in the modern history from, for example, Sakuradamongai Incident (1860) up to now. Sites related to the last days of Tokugawa regime and the Meiji Restoration, the Privy Council, the air-raid shelter where the imperial decision on ending the war was given on 14th. August 1945, old military buildings, Martial Law Headquarter (2.26 incident), etc. All the sites might be seen and passed casually. 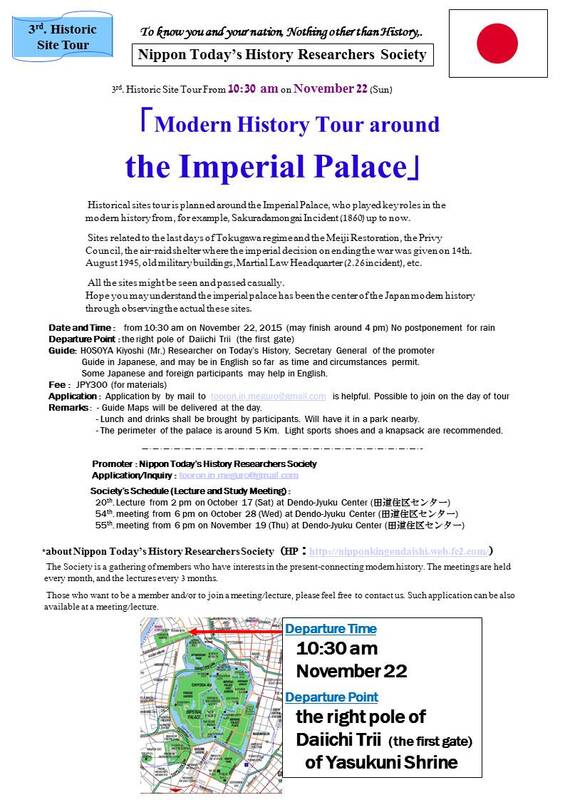 Hope you may understand the imperial palace has been the center of the Japan modern history through observing the actual these sites. Guide in Japanese, and may be in English so far as time and circumstances permit. Some Japanese and foreign participants may help in English. - Guide Maps will be delivered at the day. - Lunch and drinks shall be brought by participants. Will have it in a park nearby.